Dozens of children in Darfur have allegedly been killed by chemical weapons dropped on them by their own government, it is claimed. Amnesty International say the children are among more than 200 people estimated to have been killed by the banned weapons since January. Those affected by the "poisonous smoke" vomit blood, struggle to breathe and watch as their skin falls off. The Sudanese government has said the allegations are baseless. Will Sudan ever find peace? "The allegations of use of chemical weapons by Sudanese Armed Forces is baseless and fabricated," Sudan's UN Ambassador Omer Dahab Fadl Mohamed said, quoted by Reuters. "The ultimate objective of such wild accusation, is to steer confusion in the ongoing processes aimed at deepening peace and stability and enhancing economic development and social cohesion in Sudan." The government in Khartoum and rebels have been fighting in Darfur for 13 years. Yet the conflict and its toll on the western region's citizens has fallen off the radar since 2004, when warnings of a potential genocide forced the outside world to act. But a new report into repeated attacks by the Sudanese government against their own people reveals "nothing has changed", according to Tirana Hassan, Amnesty's director of crisis research. 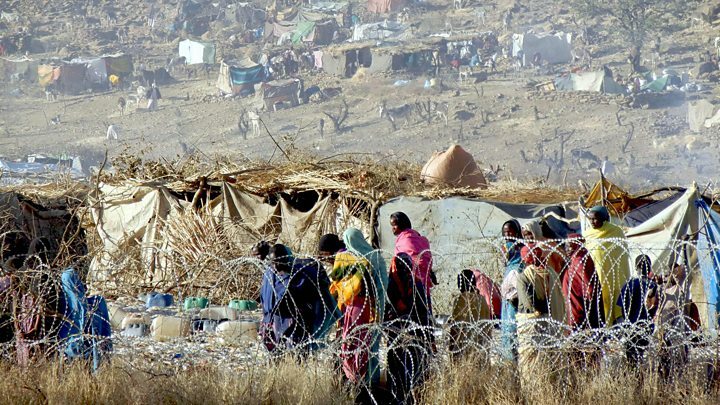 The human rights group's eight-month investigation uncovered "scorched earth, mass rapes, killings and bombs" in Jebel Marra, a remote region of Darfur. Researchers also found 56 witnesses to the alleged use of chemical weapons on at least 30 occasions by Sudanese forces, who launched an offensive against the Sudan Liberation Army, led by Abdul Wahid (SLA/AW) in the middle of January. "The scale and brutality of these attacks is hard to put into words," said Ms Hassan. "The images and videos we have seen in the course of our research are truly shocking; in one a young child is screaming with pain before dying; many photos show young children covered in lesions and blisters. Some were unable to breathe and vomiting blood." Survivors told Amnesty International of the putrid and "unnatural" smelling smoke which filled the air after the bombs were dropped. Many began vomiting within minutes of coming into contact with it. Often, the vomiting and diarrhoea would be bloody, while others were left with "bulging" eyes. Survivors' eyes were also reported to change colour, as did their urine and their skin, which would then harden and fall off. A man named Ismail, who tried to help people in late January, told Amnesty: "Their skin was falling off and their bodies had become rotten… and their breath was very bad". Several of the children he treated died, others were still in pain months later. Two independent chemical weapons experts agreed the injuries seen were consistent with a chemical attack, with symptoms pointing to vesicant or blister agents. Amnesty is now calling for an investigation, and for governments to apply pressure on Khartoum, in particular to allow humanitarian agencies access to Darfur's remote populations. Ms Hassan said: "The fact that Sudan's government is now repeatedly using these weapons against their own people simply cannot be ignored and demands action. "This suspected use of chemical weapons represents not only a new low in the catalogue of crimes under international law by the Sudanese military against civilians in Darfur, but also a new level of hubris by the government towards the international community."